It's the best anniversary present ever. Holy moley, our little baby done growed up. The little club Adrian & Mysterious D started 5 years ago (bringin me on for the second one) to play some kooky mashups has become a gigantic, uncontrollable monster: from what I understand, the 5-year anniversary party at DNA Lounge Saturday night brought out 1500 party people. A+D had an insane performance full of drag queen lip-synching and nutty dance troupes; I was lazy and just decided to play tunes (and, er, "sing" with Smashup Derby, see above left). What tunes did I play, you may ask? Well, you can relive my sets, even if you decided to stay home and eat chips Saturday night. As always, DNA Lounge archives audio from their club nights on their web site here, but I pulled my sets from the feed and saved them as MP3s so you can load them up on your Zunes. Check them out (and their playlists) over at the Long Mixes Page. Just a few hours earlier, at 6:00 Friday night London time, BBC Radio 1 morning show host Chris Moyles was participating in a "soundclash" DJ battle with fellow Radio 1 personality "Comedy Dave" live on stage at a festival in Newquay (that's pronounced "nukey") on England's west coast. Apparently the point of this event was that Chris and Dave would take turns playing songs of their choosing, and then judge the victor by audience response. Well, apparently Mr. Moyles has some unresolved mashup issues, since he played six (6) Party Ben productions during the hour-long battle, including a dance mix of "Snow Police," "We Will Jump You," "Led Snooppelin," "Rehab (Can't Help Myself)," "Galvanize the Empire," and "Ooh La La Summer Nights." Listening to the broadcast feed, some appeared to work better than others; the crowd just wanted to sing along with some of their favorite tunes, but Party Ben mashups do tend to move things around a bit, making singalongs a bit difficult. 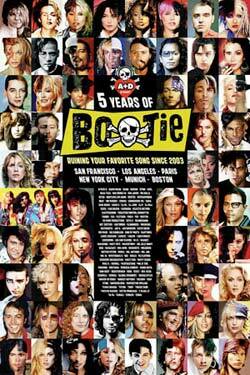 Thus the "Rehab" boot, for instance, just seemed to confuse everybody. Ah well. Moylesy cut off a few of them before they finished in an apparent acknowledgement of that fact, although by the end, he was scored the winner, so I guess everything turned out okay. 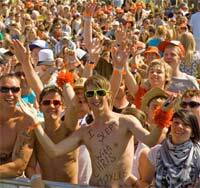 Either way, it's kind of exciting hearing my tracks played for a crazy festival crowd. The whole show is up for a few more days on the BBC iPlayer, or check out an edited version below. Featuring myself and DJ MyKill of French Kiss fame. 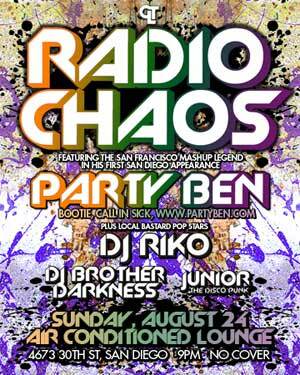 Electro, Bmore, fidget, bassline, retro-rave, remixes, cutups, crazy crap with laser bass noises. Every Third Thursday. 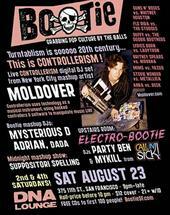 Featuring regulars Adrian, Mysterious D, Dada and special guest Moldover. 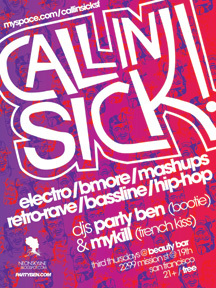 Me and DJ MyKill bring Call In Sick flavor to the upstairs Electro-Bootie lounge! W/ White Mike, DJ Mateo, DJ DRRRRN. ELECTRO NUTTINESS FOR YOUR HOLIDAY WEEKEND! W/ DJ Kue, MyKill, myself.